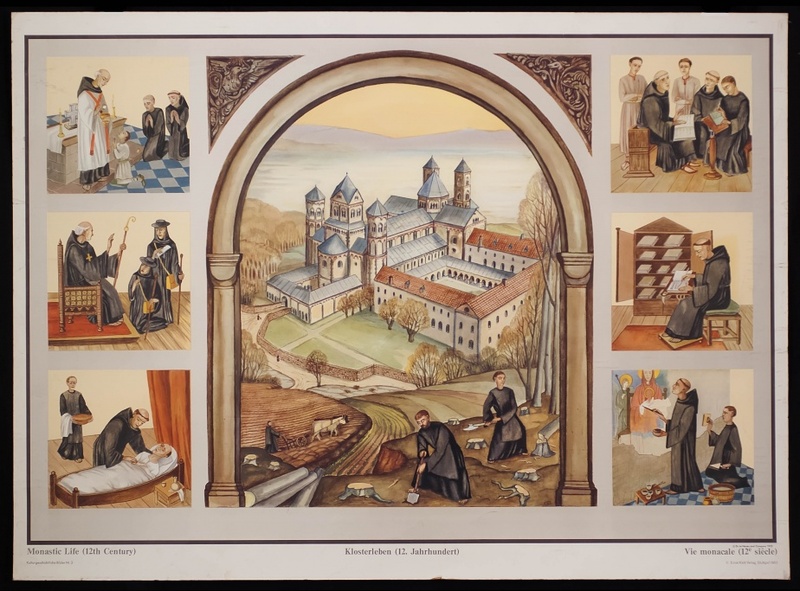 On seven depictions this wall charts shows a medieval monastery and the different tasks of monastic life. In the center of the wall chart you can see the big picture of a monastery complex: the church, a cloistered courtyard as well as the refectory, the dormitory, the chapter house and the necessarium). Monks are working in the woods and on the fields surrounding the monastery. 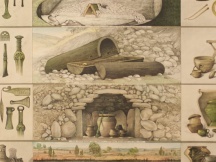 On the small depictions monastic life is shown by pictures showing worship and prayer (2), education in a local school (3), hospitality (4), studying the scripture and copying manuscripts (5), pastoral care (6) and maintenance works (7). The wall chart probably shows the oldest European Benedictine monastery in the form it had in the 12th century. The development of towns and universities changed the feudal system which formerly collaborated with the monasteries.